Because Boston Harbor provides some of the country's most exciting salt water angling. 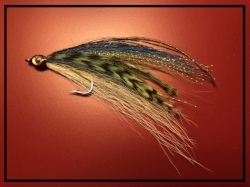 You will experience world class striped bass and bluefish action on quality fly and light spinning tackle. 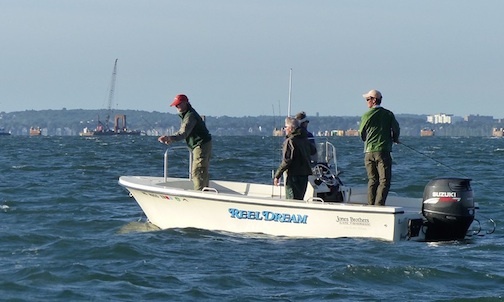 We will fish the waters surrounding the historic Boston Harbor Islands, from Hingham to Dorchester Bay, including the Inner Harbor and the islands of the Outer Harbor. Anglers will experience the beauty and challenge of fishing the rocky shoreline of the Outer Harbor Islands to the unique “urban fishing” setting of the Inner Harbor. Whether you are new to the sport or a seasoned angler, you will thoroughly enjoy the productive waters around Boston Harbor. Fish comfortably and safely from this ultimate big water fly and light tackle fishing craft. The boat has plenty of fore and aft casting room for two to three anglers. It is equipped with sonar to locate productive fishing spots, VHF radio, cell phone and GPS for safe navigation at night or in a fog. Rowes Wharf Pick-up for folks who live, work, or vacation in Boston. I offer multiple boat charters for larger corporate fishing parties. Wear soft soled, non-marking shoes or sandals. PLEASE! The season runs from mid-May through October and the weather, wind and tides will determine where and when we will fish.